The Hoxton Classic is a slim cigarette-style vape kit that makes vaping extremely easy. This tiny device is a great option for those who are looking to start vaping but are a little unsure on where to begin. Now available in a luxe black finish, this pocket-sized cigarette-style vape is worth its weight in gold. 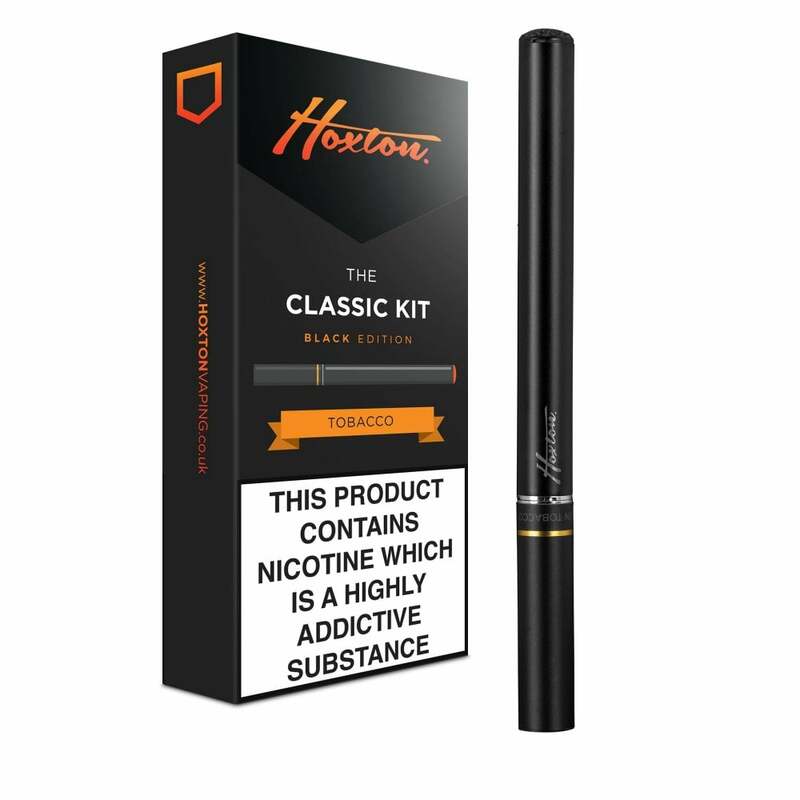 The Hoxton Classic Black Edition Kit has similar dimensions to a traditional cigarette and comes with an 18mg tobacco cartomizer: to start using your Classic Kit, all you need to do is screw the cartomizer onto your battery (making sure that the battery is charged) and inhale on the mouthpiece. When you take a puff on your Hoxton Classic, the LED tip will glow orange to show it's fully activated. Each cartomizer provides around 300 puffs, which is roughly equivalent to the number of puffs you'd get from a pack of cigarettes (depending on usage). Hoxton Classic refills are available in Tobacco and Menthol. The Classic Kit’s 280mAh battery can be recharged quickly using the USB charger included in the pack. Simply screw the battery onto the charger and plug the other end into a suitable USB port to recharge your kit. If you’re looking for an authentic cigarette-style vaping experience that looks sleek and stylish in your hand, look no further than the Hoxton Classic Black Edition. This kit is ideal for former smokers looking to make the switch to vaping as smooth and problem-free as possible. Fair vape for a cig-a-like. Nice smooth draw, definitely distinct British Tobacco flavour liquid. Just what I've been looking for :) I'd recommend this for the bargain that it is. I bought this product because it looked stylish, and it is, the only downside is that you need a really good pair of lungs to draw vapour through the tip. Unfortunately it’s not a comfortable vape.